A good night's sleep is vital to physical and emotional well-being. The Marshall Sleep Disorders Center is accredited by the American Academy of Sleep Medicine. Our sleep center features six sleep suites, four board-certified sleep specialists, a number of certified sleep technologists, as well as physicians board-certified in Family Medicine, Internal Medicine, Neurology, Psychology and Pulmonology. 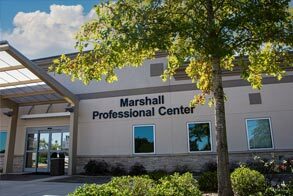 If you suspect you have a sleep disorder, the doctors at the Marshall Sleep Disorders Center will work closely with you to evaluate your symptoms and make an accurate diagnosis. Our doctors and staff will continue to work with you through every step of treatment to ensure you get the best possible treatment for your individual needs. Unhealthy sleep and sleep deprivation are linked to heart disease, depression, obesity and lower life expectancy. Seventy million people suffer from chronic, severe sleep disorders in the United States alone. These include difficulties sleeping at night, problems with excessive daytime sleepiness or other medical problems that may occur or be increased during sleep. Sleep disorders are usually medical conditions that cause difficulty going to sleep and/or staying asleep, and waking up unrefreshed. If you often feel sleepy during the day, you may have a sleep disorder. The most common sleep disorder is obstructed sleep apnea (or OSA). Other common sleep problems we diagnose and treat include insomnia, restless leg syndrome, periodic limb movement and narcolepsy. Are you an adult at risk of sleep apnea or other sleep disorders? To determine if you may be at risk for sleep apnea, take this simple test. Snoring Do you snore loudly? Tired Do you often feel tired or sleepy during the day? Observed Has anyone seen you stop breathing while you're asleep? Blood Pressure Do you have high blood pressure? If you answered YES to two or more of these questions, you are at high risk for sleep apnea. Please call the Marshall Sleep Disorders Center today for more information at 256.894.6850. If you suspect you may have a sleep disorder, we invite you to take this quick self-assessment prior to contacting Marshall Sleep Disorders Center for a consultation. If you suspect you may have a sleep disorder, we invite you to take these quick self-assessments prior to contacting Marshall Sleep Disorders Center for a consultation. If you have been scheduled for a sleep study, please print out and complete this Pre-Visit Questionnaire and bring with you to the clinic. This will save time during your check-in procedures. If you are not able to bring the completed form, please arrive 15 minutes early for your appointment. For more information, please call 256.894.6850. An overnight sleep study is a way for our doctors to monitor you for one full night so they can determine why you aren't getting a good night's sleep. The Sleep Center features comfortable and quiet rooms that are very much like your bedroom at home. Skilled sleep technicians will attach small sensors to you to monitor breathing, movement, oxygen levels and brain activity. Then, you go to sleep just like at home. Technicians will monitor you during the night and also video record you while you're sleeping to see how much you toss and turn. If you have trouble going to sleep in a strange environment, a doctor will provide a sleep aid. Our staff will provide complete instructions for your sleep study when you make an appointment, and they will be available before your appointment to answer any questions. After your study, your doctor will review all of the information and make a diagnosis. You will follow up with your sleep physician at his/her office to go over your results and/or treatment options.